When my children were very small they used to delight in a game to get my attention. 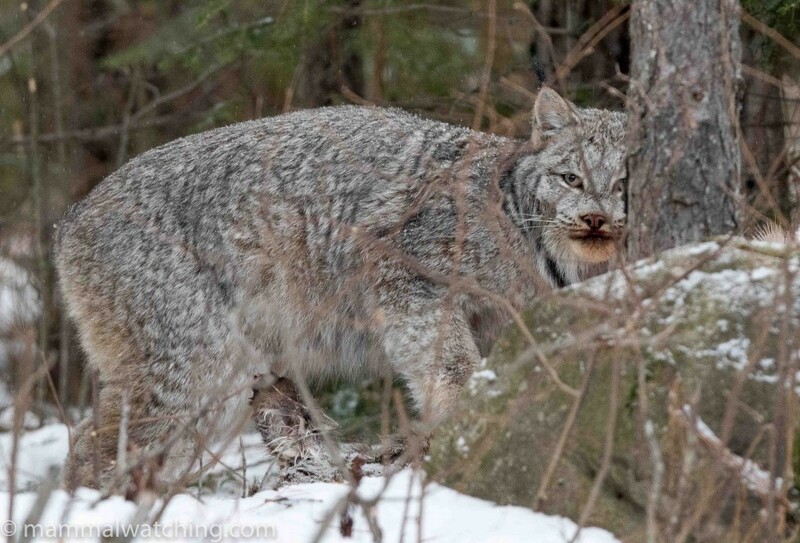 “Look Daddy” they would say at random moments “a Lynx!”. I would then have to spin around and pretend to walk into a lamppost while they snickered at their cunning deception. So when I suggested to them in early 2017 that we spend a couple of days in northern Minnesota trying to see this legendary creature they were almost as excited as I was. 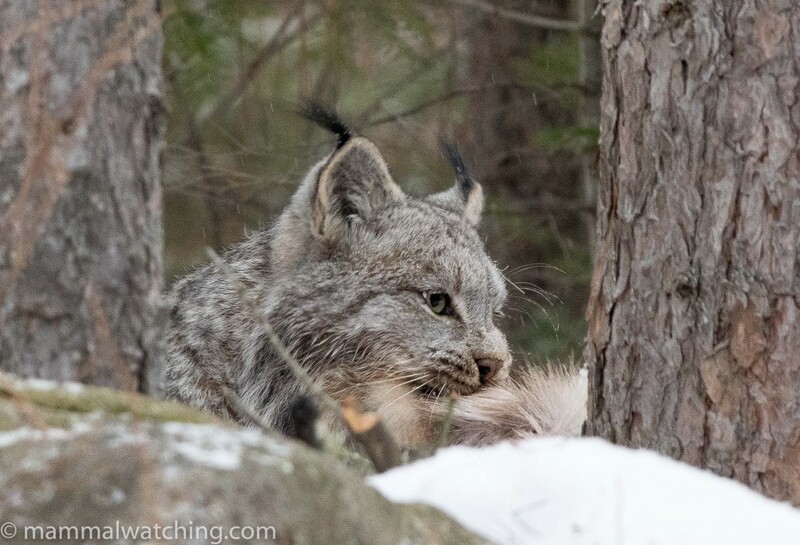 The forest around Grand Marais is probably the best place to look for Lynxes in the USA outside of Alaska. They are still, however, far from easy to see, at least when the Snow Shoe Hare population isn’t booming. Chris Townend’s WiseBirding Lynx tour in 2016 had seen one and I had hoped to join Chris on his 2017 tour for a few days. But Chris’s plans changed, and I wanted to bring my kids: delightful as I like to think they can be I wasn’t sure anyone else would appreciate their company for more than 30 minutes. So I made separate arrangements. 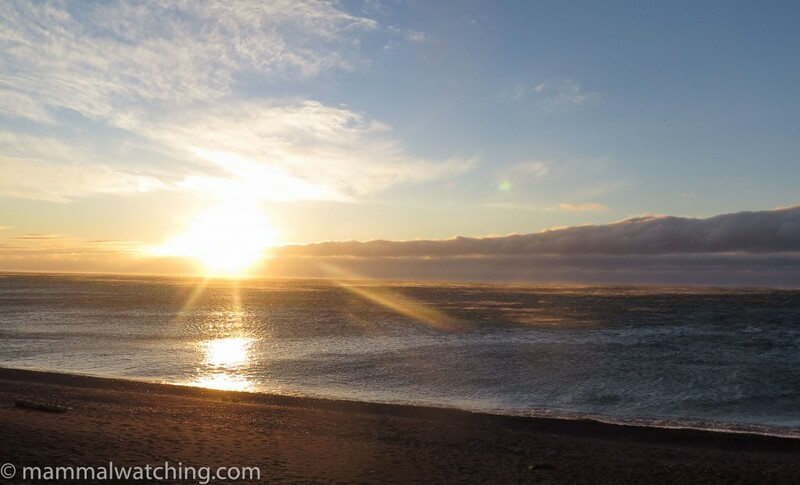 We based ourselves in the small town of Grand Marais, a 4.5 hour drive from Minneapolis St Paul Airport, and close to the Canadian border. I visited the deer carcass before dawn on my first morning and found the Wisebirding vehicle there. 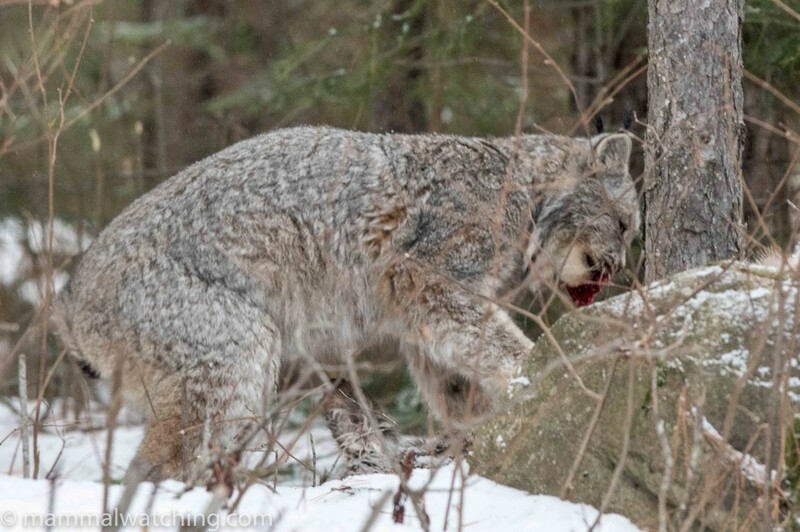 Though they hadn’t seen a Lynx, their trail cam had picked up a mother and cubs, as well as another animal, visiting the carcass over the previous 24 hours. The first evidence of a Lynx visiting the site since they had arrived a few days earlier. I spent the day with my kids and returned to the carcass at around 5 p.m. Chris had been there all day but no Lynx had shown. He packed up about 5.30 p.m and I thought I would hang on another hour til the light faded. Not long after Chris left a largish shrew dashed around the snow for a few seconds: I couldn’t see it well enough to be sure but it was pretty big and probably a Northern Short-tailed Shrew. 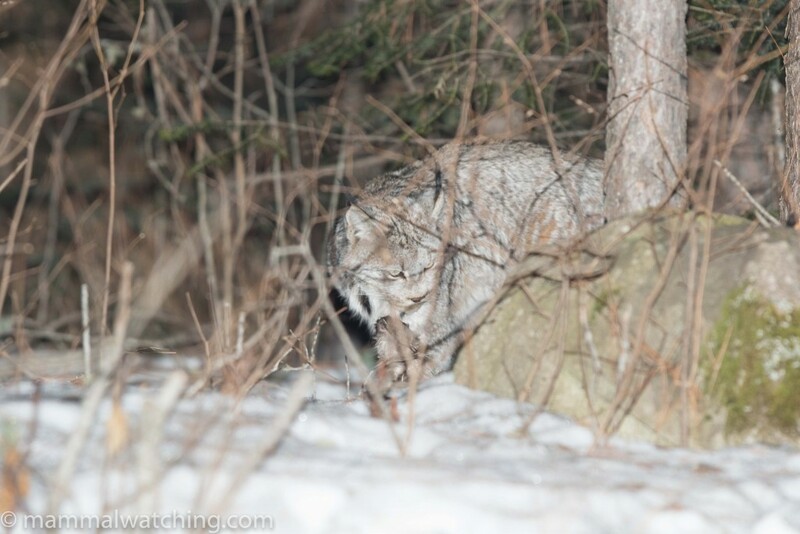 Right on dusk, and right as I was about to leave, a Lynx wandered through the trees and started feeding on the carcass about 15 metres from the car. Cue breathless excitement! 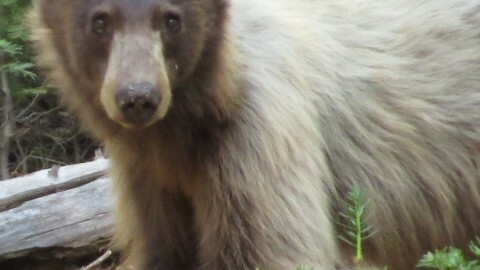 We spent an hour watching the animal and trying – not very successfully – to take pictures. A truly spectacular beast that had the kids and me transfixed despite the freezing wind whistling through the car window. It was remarkably tolerant of us and the vehicle. I hadn’t set up a spotlight so – after the animal arrived – I had to reverse the car back to the road, get out, attach a light to the battery, then drive back down to the carcass. 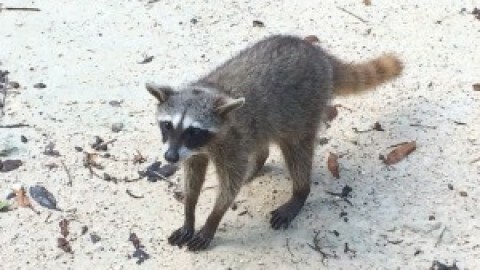 It barely raised its head. 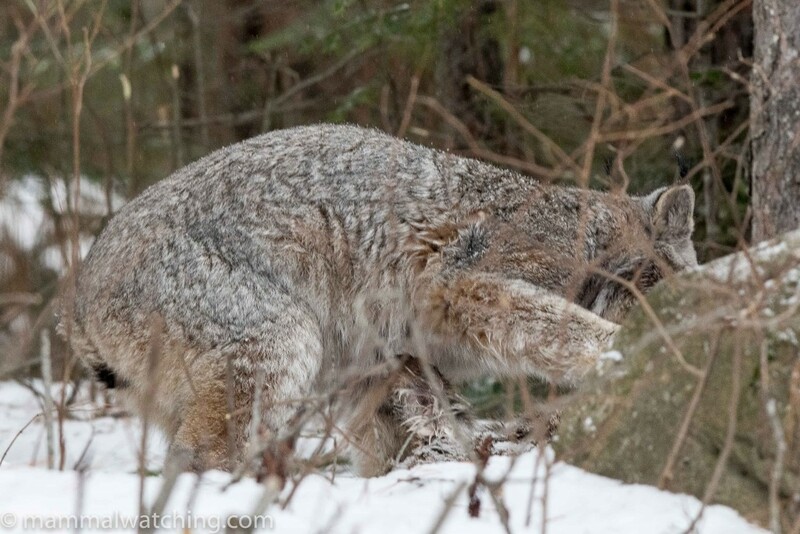 I suspect I was extremely lucky to see a Lynx so quickly. 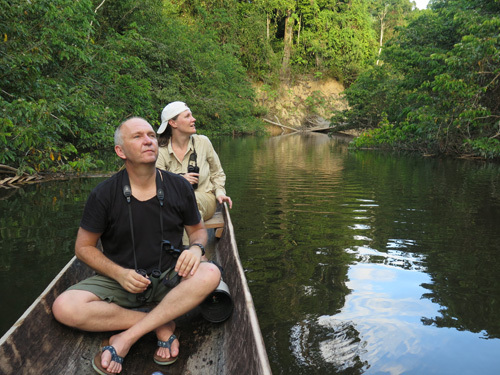 Though Chris Townend went on to have great views he was in the field for 60 hours that week before he saw one. I didn’t do any more mammal watching until our last morning when I stopped at the deer carcass at 8 a.m. on my way from Gunflint Lodge to the airport. I wanted only to see if anything was happening. 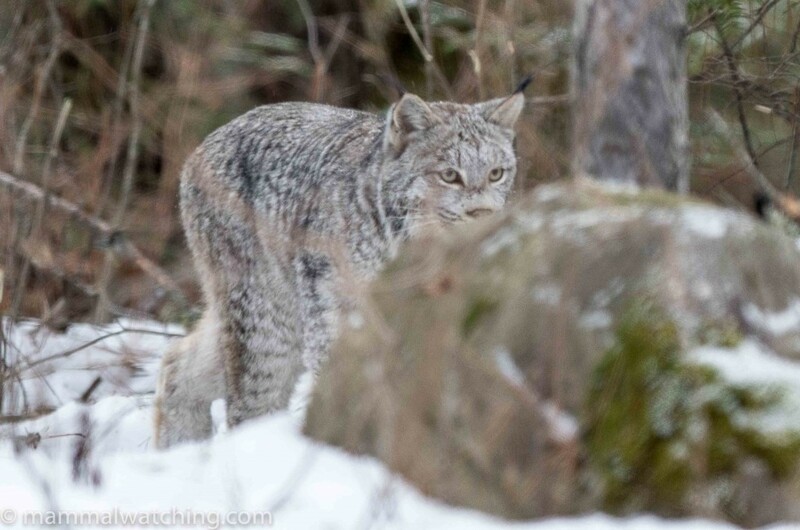 And as soon as we pulled up Patrick spotted the Lynx coming into feed and we spent another hour with the animal, this time in daylight. Wonderful. And yes, I know, I was very lucky. 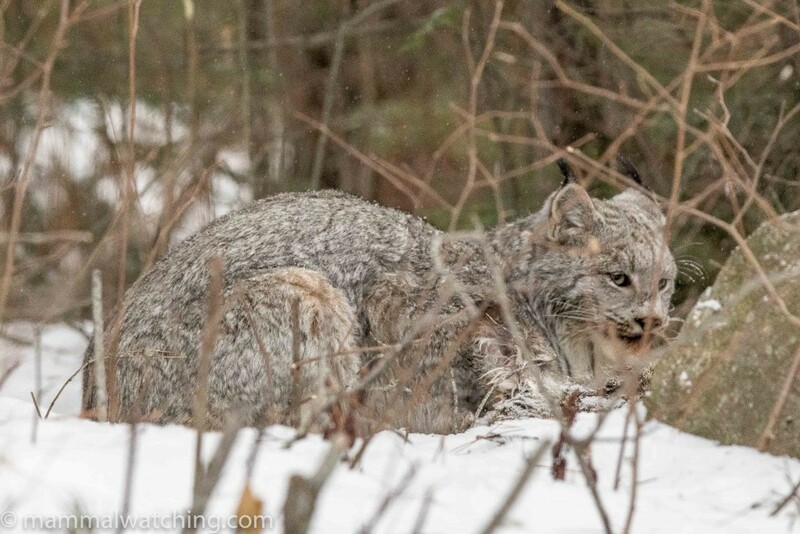 Late February is Lynx breeding season and, according to David Johnson, one of the best times to look for them. 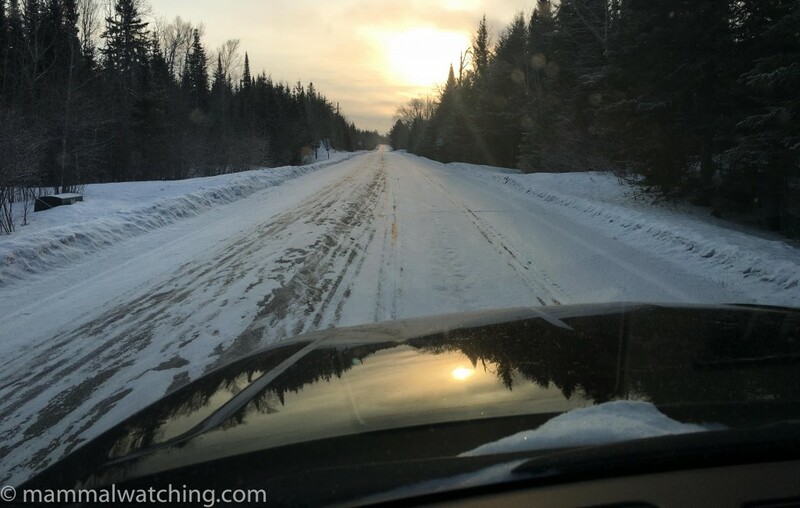 The forest between Grand Marais and the Gunflint Lodge seems to be a key area to focus on, particularly the 30 miles of the Gunflint Trail, and side roads, before the lodge. Driving on the side roads in particular – which were ice and compacted snow – would be challenging without a four wheel drive. And the temperature at that time of year doesn’t usually get above freezing, and is often well below. As I said, I was spectacularly pleased to see an animal so easily and wouldn’t have done so without help from David Johnson and Chris Townend and my thanks to both of them. By far your best chance would be to join the Wisebirding trip next year. 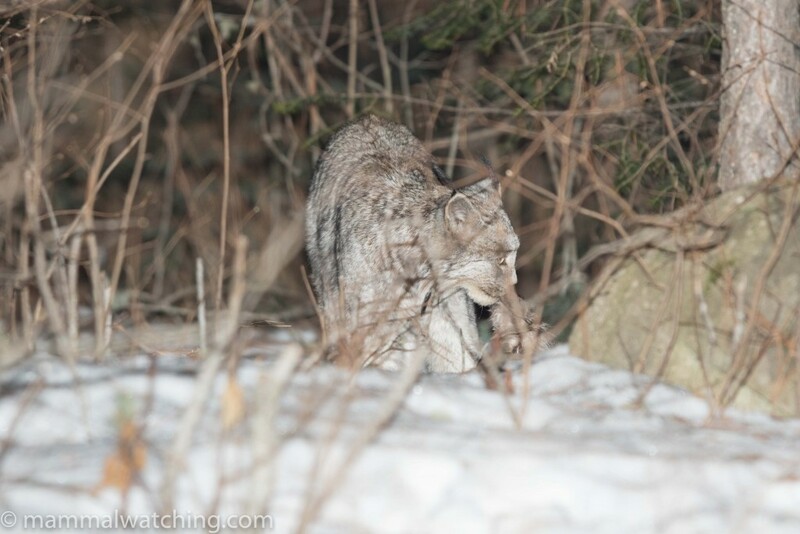 As of March 13, David tells me a Lynx is still visiting the carcass and Fishers too. So if you can get to Minnesota….